1. INVASION OF THE BODY SNATCHERS (1978) – this is the only one on the list that I wouldn’t argue is definitely better than the original, but it’s pretty damn close. Transposing the McCarthy-era paranoia of Don Siegel’s 1956 classic to the pre-Reagan era, Philip Kaufman’s remake presents an even darker vision, complete with a chilling ending in the spirit of the one Siegel had originally envisioned for his film, before the studio interfered to happy it up a little. Featuring great performances by Donald Sutherland, Jeff Goldblum and Leonard Nimoy, and state of the art special effects for the time, this is a truly frightening film, the rare remake that lives up to its source material. 2. JOHN CARPENTER’S THE THING (1982) – I’ve written before about my love for this, one of the greatest horror films of all time, but it bears repeating. Carpenter’s update of the 1951 Howard Hawks production The Thing from Another World is an unqualified masterpiece, featuring a tough guy overload in the two lead performances from Kurt Russell and Keith David, as well as some of the nastiest, scariest monster effects ever filmed, and perhaps the best performance ever given by noted oatmeal guru Wilford Brimley. Hawks’ original film is one of the best of the paranoid 1950s space invasion movies, but Carpenter’s remake still manages to blow it out of the water. 3. SCARFACE (1983) – Howard Hawks is one of my all-time favorite filmmakers, yet here he is again, being bested by a remake. To be fair, I love his screwball comedies – Bringing Up Baby (1938), His Girl Friday (1940), Ball of Fire (1941), Monkey Business (1952) – the most, and I don’t think any of them can be improved upon. Scarface (1932), though probably the greatest gangster movie of its time (its main competition would be the 1931 James Cagney classic The Public Enemy), lacks the visceral power of Brian De Palma’s remake. The violence, profanity and moral complexity missing from Hawks’ film are all right at home in 1980s Miami, and I’ve always found it interesting that Tony Montana’s (Al Pacino) humanity is what ultimately precipitates his downfall: by refusing to kill the little girl who happens to be in the car with the political figure he has been assigned to assassinate, Tony signs his own death warrant. 4. THE FLY (1986) – this one’s not even close. The 1958 original was a modestly entertaining B-movie whose main claims to fame were a rather small supporting turn from the great Vincent Price and a cool concept: a scientist accidentally fuses himself with a fly in an experiment gone awry. When he comes out of the machine, he is a classic 1950s monster, a sort of Minotaur with a fly’s head instead of a bull’s. David Cronenberg’s remake takes the concept much further, fusing the DNA of scientist Seth Brundle (Jeff Goldblum) with that of a housefly at a molecular level. Instead of a cartoonishly large fly’s head, Brundle gains the fly’s strength, energy and agility before gradually disintegrating into a truly hideous monster, a triumph of practical effects on par with the nightmarish creations in The Thing. 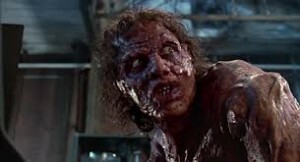 Cronenberg’s The Fly has been interpreted as a metaphor for the AIDS crisis of the 1980s, but I think cocaine addiction is the more accurate subtext here, as Brundle’s failed experiment seems to make him better, faster and stronger, before it ultimately destroys his life and the lives of those who love him. 5. CAPE FEAR (1991) – like Hawks’ Scarface, the original Cape Fear (1962) was a legitimate American classic of its time, made even better by the added moral complexity afforded by the remake. The original was black and white in more ways than one; everyone knew by the casting alone who was going to be the bad guy between Gregory Peck and Robert Mitchum. Martin Scorsese’s reimagining takes a bolder approach, positing that Robert De Niro’s Max Cady is just a much darker shade of gray than Nick Nolte’s unethical lawyer, Sam Bowden. The film also explores the undeniable sexual attraction that both Sam’s wife, Leigh (Jessica Lange), and teenaged daughter, Danielle (Juliette Lewis), feel for Cady, and it contains one of the cinema’s most frightening moments in the scene where Cady shows up unexpectedly at the Bowden house while it is under the protection of a private investigator (Joe Don Baker).